Guest house Viña y Rosales is an extraordinary mansion house with a pitched roof. In the Alpujarras valley, houses in general have flat roofs covered with 'launa', a blueish grey clay, that "closes" when wet, after a rainy day, and "breathes" when dry. 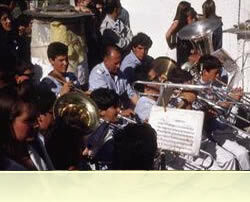 Alojamiento rural Viña y Rosales in the village of Mairena, is well known by every villager for its diverse history. Guest house or alojamiento rural Viña y Rosales is named such because of the roses and vines in the garden. This Andalusian mansion house has a remarkable architecture, with four spacious guest rooms, providing an agreeable atmosphere, and having its own spring with excellent tasting drinking water. The garden has several terraces with an abundance of flowers, herbs, fruit and vegetables. Alojamiento rural Viña y Rosales is a comfortable bed and breakfast accommodation or B&B holiday lodging, where you will feel at home and will have a vacation you will not easily forget. Mairena is one of these villages along the scenic GR7 mountain route of the Alpujarras where time ceases to exist. Harvests and firewood are still hauled to the village by mule or donkey and the shepherd with his sheep and goats passes through the village. Whitewashed houses seem organically formed, from Moorish times onwards. Colourful flower pots and bougainvillea’s hang down facades and balconies. Except for a small bar and one shop, there is nothing more than tranquillity, fresh air and plenty of wild nature. 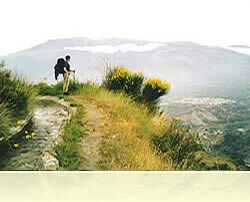 A splendid environment for a memorable rural trekking holiday you could experience right here! via an ingenious system of water canals dating from Moorish times. E4 / GR7 (more information - click here) and the SULAYR route, that circumference the Sierra Nevada. Several walks start from the village of Mairena, in the council of Nevada. 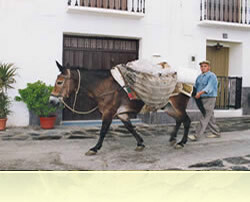 Over the last twelve years eco rural / ecotourism or agriturismo / agroturismo became more popular in the Alpujarras. The diversity of nature in the greater region of the Siera Nevada has no equivalence compared to the whole of Europe!